Lithuanian Farmer and Greens Union (LVŽS) chairperson Ramūnas Karbauskis released depersonalised documents from the LRT council on the national broadcaster's contracts in a Tuesday press conference. Journalist Edmundas Jakilaitis and LRT deputy director general Rimvydas Paleckis attended R. Karbauskis' Tuesday press conference. "As I announced, I will attempt to present the reasons why a Seimas commission on the LRT was inevitable and justified," R. Karbauskis said. He also said that upon receiving the documents, the MPs could see that it is not just the National Audit Office that should be contacted due to them. During the press conference R. Karbauskis presented certain LRT contracts with producers, however these were more akin to separate number lines. However, he assured that upon receiving them, the Seimas had no other choice than to investigate this situation "so that more discussions over politicking would arise." "We are not politicking here, it is our duty and we will enact it," the politician noted. R. Karbauskis assured he is aware why there is resistance to a Seimas probe – apparently because there is unwillingness to provide more information. The politician said that a "group of friends" is active in the LRT; however, he stated he would not speculate whether this is good or bad. "I am not evaluating a single document or situation; I just mentioned what stands out as peculiar. Not a single one of my words is an attempt at accusing," the LVŽS leader said. He stated that the LRT presented the Seimas with its 2016 report, but it was not detailed, thus the MPs requested further information. It was apparently presented in a limited capacity. 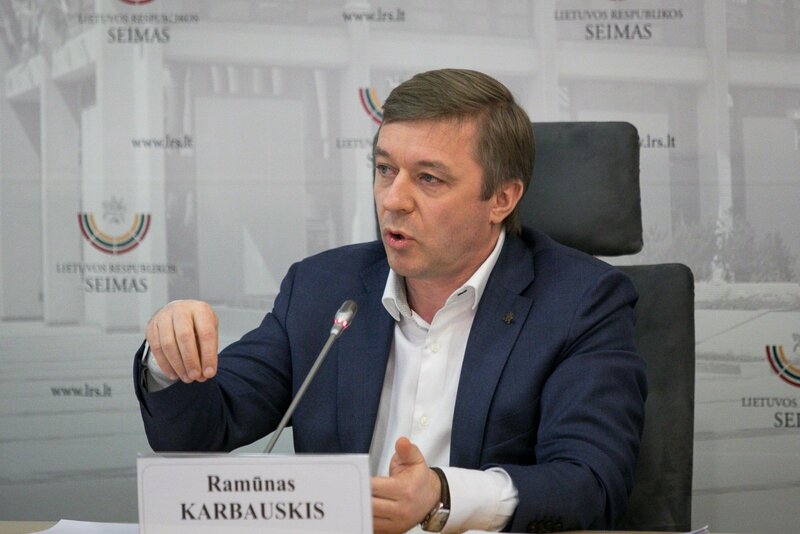 "The limited capacity is enough for the public to know that the Seimas' decision to investigate the LRT's financial activities is inevitable," R. Karbauskis assured. He explained that the information from the LRT was presented chaotically to the MPs – estimates and certain contracts were missing, including some, which were allowed to be presented. The politician assured that the disorder shows potential issues in LRT document keeping. "I am certain that the LRT council does not even know what was presented to the Seimas. It was just a stack of documents," he said. R. Karbauskis released a list of production companies, which refused to release their contracts with the LRT to the public. This list contains such companies as Music Mills, Rijeka, Valius, Just TV, Media 3, TV Europa, Makas, Production Team, NPT Projektai, Beatos Virtuvė, VIlniaus Medija, Studija Paprika, Media Volpe, Big Adventure. According to the politician, other information was presented to the Seimas as well: the ratio of shows prepared by LRT and production companies. The ratio was presented to the Seimas in percentages, but according to R. Karbauskis, the numbers would be completely different if funding was outlined for show making expenses. The LVŽS leader also presented a depersonalised public purchase example: the LRT purchased a portable television station for more than 3.7 million euro through undisclosed negotiations. He also spoke of wage payment and authorship contract ratios in the LRT. According to the politician, some 60% of the staff receive wages both as a wage and as author royalties. "It is extremely difficult to explain what positions are assigned to what number of staff. The question arises whether this is not an effort to avoid further taxation and people are clearly losing out on social guarantees," he said. As an example of scandal, he pointed to an adjustment in "some show's" contract, which specifies that the producer is to be paid more than 111 thousand euro. "In this case it is not talk about sums. We [the Seimas] receive such sums and see that an hour, couple of hours are valued at 140 thousand euro. However, when presenting the bills, the contracts and estimates for the LRT and producers are presented. We believe that the Seimas was presented with different estimates for shows – those that the Seimas was not supposed to receive. We received estimates, which match cent for cent, and the sums are in the hundreds of thousands. They allowed to publicise everything, but somehow mistakenly attached the wrong estimates," R. Karbauskis spoke. According to him, this is an example when the estimates for shows broadcast at different times match cent for cent. He was surprised that often addendums are attached to the contracts, for example the value of the expected services is 377 thousand euro, while the value of the addendum is 123 thousand euro. According to R. Karbauskis, the addendum would be granted to the producer. According to him, various unpaid contracts were found, but later they would be amended with an extra point, which was not there earlier, and they would become paid. "It is very difficult to explain to lawyers, why the addendum about payment appears later and is then removed again. It is incomprehensible how unpaid contracts become paid and vice versa," the politician said. He also mentioned the LRT show "Tūkstantmečio Vaikai" [Millennium Children]. Its estimate "clearly reveals how the LRT covers all costs," R. Karbauskis assured. According to him, in 2016 this reached more than 50 thousand euro. E. Jakilaitis who attended the press conference inquired, "Are you intentionally fooling the public, calling Eurovision national finals broadcasts or the LRT's 60th anniversary broadcast as shows? These are major events," the journalist said. R. Karbauskis assured that part of society understands that what is called the "Eurovision" selection stage costs tax payers around 0.5 million euro. "Perhaps this is not a massive amount, but the public must know what the value of things done is. How much do we know today, how much renting an arena costs? When there is no estimate for the show, no explanation of expenses, no institution could evaluate it in any way," R. Karbauskis said. According to him, doubts arise, how a two-hour show's estimate specifies one thousand euro wages for performers. "How do you explain to a teacher – why are such sums paid for one song?" he questioned. R. Karbauskis announced the press conference where "scandalous facts" about LRT fund usage last Thursday. "Seeing that there will be efforts to increasingly pressure the Seimas commission and me personally, I decided to make use of my right to release certain depersonalised documents sent by the LRT to MPs so that it would be clear that the MPs' intent to investigate LRT financial activities has far more basis than can be imagined," R. Karbauskis said on Facebook. He assured that the documents reveal "such scandalous facts about LRT fund usage that initially, before calling upon the LRT, it could not have been imagined." R. Karbauskis stated he is prepared to accept all the consequences for the release of the confidential documents. R. Paleckis who also participated in the press conference described R. Karbauskis as "a very good politician, but very poor television viewer." He stated that through this act, the LVŽS leader revealed that the LRT investigation truly is politicised. "It would appear that the member of Seimas, who releases legislation, has not truly delved into what he is discussing. What we heard today, to put it lightly, is very incompetent. It can be seen that the press conference was rushed in order to divert attention from other topics which could perhaps appear," R. Paleckis explained. When asked about R. Karbauskis' statements that apparently some 60% of LRT staff receive wages in different forums, the deputy director general for LRT assured that the national broadcaster's administration "enriched" all the journalists' wages, while earlier truly minimal wages and royalties based on authorship agreements were paid. R. Paleckis also commented on the LVŽS leader's surprise over the purchase of the portable television station. "In this regard, the Public Purchase Service gave us a permission to purchase as we did. I cannot comment in more detail, I am just presenting the fact," he stated. Talking about R. Karbauskis' statement on apparently mistakenly provided contracts of equal value to the Seimas, he mused that a mistake could have been involved in the LRT council providing data to the Seimas because a very brief period right before Christmas and the New Year was provided. R. Paleckis also explained that to compare estimates for television shows and event broadcasts, as R. Karbauskis did, cannot be done because preparations for an event can last a whole year. "The Eurovision finals – that's also preparation for an event. It is constant work," he said. The conflict between the Seimas majority and the LRT sparked last autumn when the national broadcaster presented its work report for 2016. As Seimas Vice Speaker Arvydas Nekrošius of the "Farmers" stated then, the politicians found the document lacking in information about staff wages, bonuses, authorship contracts, relations with producers and such. Due to this 66 MPs, mostly from the ruling LVŽS, presented the LRT council with 45 questions. LRT director general Audrius Siaurusevičius mused when evaluating this decision that the politicians may have disliked the work of the national broadcaster's journalists. Commenting on the situation for Žinių Radijas, presidential advisor for domestic policy Mindaugas Lingė then stated that transparency requirements apply to the LRT same as all other budgetary institutions. According to him, the LRT is an institution with accountability to the Seimas, funded from the state budget, thus it is natural that the MPs are raising various questions for the LRT. At the end of December the LRT presented Seimas a list of contracts made with some 800 production companies between 2013 and 2017, however they only specified the contract dates and company names and not specific services and sums. This information was apparently not to be released publically due to confidentiality agreements. Politicians were angered that the LRT council did not present estimates for shows, thus asked it to contact the independent producers it cooperates with and request their permission to present the data to Seimas. This time it was 80 MPs who called upon the LRT council, including Seimas Speaker Viktoras Pranckietis, Prime Minister Saulius Skvernelis, "Farmer" leader, Culture Committee chairperson Ramūnas Karbauskis, as well as most of the LVŽS group's representatives. The LRT council presented the new responses to Seimas on January 2. At the same time, the politicians were advised that a part of the presented responses are accompanied by addendums whose content is confidential. Primarily this warning was applied to contracts with producers – 21 producer or production company, which cooperated with the LRT, granted the permission for politicians to review their contracts. That said 12 companies refused to grant authorisation. On January 12, under the majority's initiative, the Seimas rushed the formation of an ad hoc commission led by "Farmer" Seimas vice Speaker A. Nekrošius, which would perform a parliamentary investigation of the LRT's management, financial and business activity. The only one from the LVŽS Seimas group to oppose such an investigation was PM Saulius Skvernelis. He stated that the investigation of LRT funds usage should be performed by law enforcement because, according to the PM, the LRT used funds "not only ineffectively, but also with no transparency." With debate ongoing between Seimas and the LRT council, the majority's leaders directly involved themselves in the process. 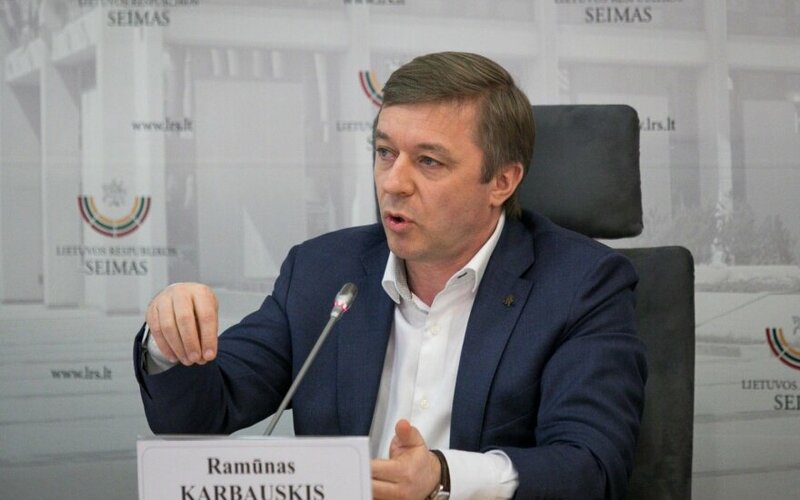 At the end of November, R. Karbauskis who leads the Seimas Culture Committee stated that he was not content with the LRT's responses to the MPs' questions and promised to take further steps to obtain information. At the end of December R. Karbauskis stated on Facebook that apparently three companies linked to LRT show host, journalist Edmundas Jakilaitis received more than 2.5 million euro income in 2016, while paying only 0.3% (7752 euro) in tax. "Why do production companies sign hundred thousand euro contracts on show creation if the same shows could be made by LRT staff? Questions for the LRT council abound because there are efforts that an institution maintained by state funding would not fear to present answers to the public, where state and its people's money is spent, that it would work responsibly and transparently," Karbauskis wrote on Facebook. IN reaction to R. Karbauskis' post, E. Jakilaitis explained that firstly one needs elementary financial literacy. "He writes about the part of income tax paid, but this is a completely different matter, what of various social security, VAT taxes and all others – we pay just as much of them as all other companies. It is not even worth commenting here, it is nonsense, I would rather not even comment on it in public," the journalist stated. Soon after E. Jakilaitis revealed that for one show, Dėmesio Centre that his company Media 3 creates, the LRT pays 932.58 euro plus VAT. Since the show is broadcast four times a week, it should cost the LRT some 14.9 thousand euro a month. Respectively, E. Jakilaitis, according to data he presents, should receive net pay of 3.2 thousand euro a month. The journalist said that he feels bad about publishing this data because Media 3 contracts with the LRT are confidential and the parties are committed to not reveal them to third parties. E. Jakilaitis also released 24 questions to R. Karbauskis on Facebook asking to explain the circumstances of the politician's businesses. At the end of December, Seimas Legal Affairs Committee chair "Farmer" Agnė Širinskienė shared what could be the potential business scheme. She presented potential links between E. Jakilaitis, his wife Rasa Jakilaitienė, producer Laurynas Šeškus and his spouse Indrė Trakimaitė-Šeškuvienė, as well as leisure organiser Jogaila Morkūnas on Facebook. The MP released data about companies linked to these individuals, which participate in LRT procurements. Among the mentioned companies, we find the company Media 3 that was founded by R. Jakilaitienė, I. Trakimaitė-Šeškuvienė and the head of the public institution Pirmoji Kava J. Morkūnas in 2009. On November 10, 2010, J. Morkūnas and I. Trakimaitė-Šeškuvienė passed on their stocks to R. Jakilaitienė. On starting work at the Ministry of Foreign Affairs, on February 1, 2013, she passed on the stocks of Media 3 to the company TV Play, where E. Jakilaitis and L. Šeškus are stockholders. On June 16, 2016, the stockholders of Media 3 changed yet again, with it passing to E. Jakilaitis and L. Šeškus. The politician pointed out that it is of note that in certain public purchase competitions both Media 3 and TV play participate, while their stockholders are the same. "Are companies with the same owners competing with one another? Or perhaps this way there are attempts to unfairly influence the conclusion of the procurement? It is unfortunate that I cannot present information whether the LRT is provided production services by UAB TV Play and UAB Media 3 because this is part of the confidential information presented to members of Seimas, but I will certainly write that the information should be presented to the public by the LRT itself," A. Širinskienė wrote on Facebook. Meanwhile E. Jakilaitis told Delfi that he believes that this post by A. Širinskienė on Facebook is a means to divert attention from his questions to R. Karbauskis. The journalist mused that the politician "mixed reality with fiction." "I am completely confident in the transparency of my activities. In my opinion we have been working successfully because we have good ideas, know how to accomplish them, react quickly to news and have an excellent team. Due to this, we prepare numerous projects not just for the LRT and LNK, but also foreign broadcasters. There have never been any dubious incomes or contracts and cannot be out of principle," the journalist said. When presenting the LRT and production companies' schemes, A. Širinskienė stated that the largest supplier of services to the public company Pirmoji Kava is specifically TV Play. The politician revealed that just for the creation of the show Lietuvos Tūkstantmečio Vaikai, Pirmoji Kava paid TV Play 1.3 million euro from 2011 to 2017. Several days ago, 15min.lt announced that L. Šeškus and E. Jakilaitis' company TV Play has been winning procurement competitions created by J. Morkūnas' Pirmoji Kava for the show Lietuvos Tūkstantmečio Vaikai for the past seven years. The LRT has been hiring Pirmoji Kava for the creation of the show since 2008. "Delfi asks whether I have an alliance with J. Morkūnas. We are simply together with him currently. In a certain regard it is true because we have decided to do several projects together. We have not created a joint company, we are simply old friends and for me who is just beginning in independent business, Jogaila grants administrative resources and other help," L. Šeškus told Delfi about these projects in 2008. As Lietuvos Žinios wrote in 2009, at the time it was stated that the educational show Lietuvos Tūkstantmečio Vaikai was initiated by the LRT together with the Ministry of Education and Science. The latter institution contributed funds through a competition curated by its subordinate institution Lietuvos Jaunimo Turizmo Centras' for civic and national education project support. In 2011, the company Pirmoji Kava secured EU support for the Lietuvos Tūkstantmečio Vaikai project based on an application. In 2011-2015, it was paid 852.6 thousand euro. With a new financial period beginning from 2016, funding for Lietuvos Tūkstantmečio Vaikai – 175 thousand euro each – was granted without a competition by the Ministry of Education and Science subordinate Special Education and Psychology Centre, which was performing the project "Student's academic capacity recognition and nurture quality development." This year a contract of 250 thousand euro was signed. L. Šeškus has publically stated that TV Play expenses for each Lietuvos Tūkstantmečio Vaikai show are 8 thousand euro and the received financing in 2017 would reach 6.5 thousand euro per show, thus making the product non-profitable.